Forgiveness is one of the most transformative processes we can choose to experience. While there may be something satisfying about turning our backs on someone who has behaved badly or blaming her or him for hurting us, the truth is that doing so cannot and does not bring us true or lasting happiness. In fact, the opposite is true. Holding onto a grudge or ill will totally blocks our ability to have peace of mind. Innumerable studies reiterate that negative thoughts, feelings, words, and behaviors affect our mental and physical health, our success, and our self-worth. An unwillingness to forgive is like pounding your finger with a hammer and expecting the pain to be felt by the person who wronged you! It is commonly believed that forgiveness is something we do for the sake of another person. In reality, Forgiveness is something we do for ourselves. Forgiveness may be thought of as a mental and emotional housecleaning. It allows us to make room for the good we desire. It also lets us go as far as we can on this spiritual journey and receive all the universe has to offer. If we refuse to forgive, we are clinging to self-defeating feelings such as guilt, shame, blame, hurt and resentment; and when we do this, we cannot feel truly worthy of having the best God can give us. We literally choose to block all the good that God incessantly rains down on us. Part of our problem is that laying blame is a cultural and personal standard in today's world. Turn on the evening news! Whenever there is a story about something that's gone wrong, one of the first goals of the media is to find out whose fault it is, who's to blame, who's responsible for the mess. Forgiveness provides us an opportunity to step into our Oneness with all other spiritual beings and mutually evolve in our awareness of our total potential as demonstrations of spiritual greatness. A lack of Forgiveness traps us in an endless loop of blame and bad feelings that keeps our minds focused on all the wrong things. With forgiveness, we can be free from the past and turn to other, more important issues in our lives – such as how to be truly happy, to have the things we want, to thrive with a sense that we are joyfully fulfilling our purpose, and to give and receive love unconditionally. 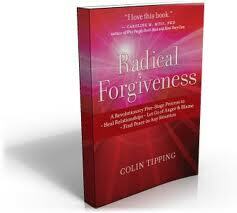 This two part class consolidates teachings of Colin Tipping from his book, Radical Forgiveness: Making Way for the Miracle. Tipping offers an entirely new way of thinking about forgiveness that is truly healing relationships. A foundation of this class is an opportunity to explore deep within for signs the universe provides with current dilemmas or repeated patterns for opportunities to heal ourselves. Learn to respect your own individual wholeness by suspending judgment on emotions which might otherwise be labeled as positive or negative. Step out of bonds of victimhood. Using the simple technique of Radical Forgiveness, you can release enormous quantities of energy that were trapped in maintaining your original negative patterns. This liberated energy then surges through your life, flowing into new positive patterns that create success and love. “Satori” is a Japanese Buddhist term for awakening, comprehension, or understanding. 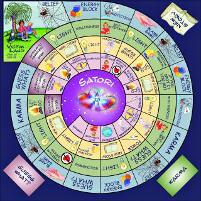 The Satori board game is based upon the teachings of Colin Tipping from his book, Radical Forgiveness: Making Way for the Miracle. This is more a game of insights and epiphanies, rather than a game of chance or skill. It is designed for 2 to 5 players and no previous experience with Radical Forgiveness is required. Starting in Victim Land, the object of the game is to reach Satori, in the process forgiving others and subsequently forgiving oneself. It intuitively fosters personal and spiritual growth with new insights in a fun and safe setting. Satori gives us the exact insights we need to move beyond victimhood and to heal our lives. This game brings forth our own spiritual intelligence to realize that life situations have been created to cause our own healing. We are offered the opportunity to heal the past by reframing it to see its perfection. The game can show us false beliefs and energy blocks we didn’t even know we had, while revealing the spiritual truth of who we really are.